The previously unreleased Tommy Boy album material, by Gravediggaz' MC, Grym Reaper aka Too Poetic aka Anthony Berkley R.I.P. Massive props go out out to Dee, his widow and Shabazz the Disciple. 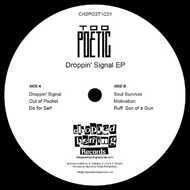 Too Poetic was a LEGENDARY yet unsung Hip Hop artist. A poet, a visionary and one of the greatests talents to represent the artform. Sadly, Anthony Berkley passed away in 2001. Here is a selection of joints from that shelved album from 1989, transferred from the original ADAT's.